VNOG Blog: So... What are you doing this weekend? And don't forget to pee before you enter the theater! No potty breaks during this one. 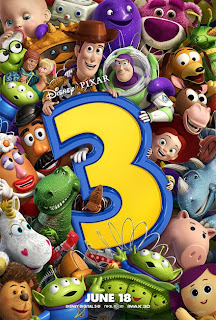 I been waiting this movie since I was child, i had very high esteptatives about the film, i´m sure that PIXAR will not disapoint me. Victor you say that this film was a challenge for you, why? and finally you work about one year on the production of the movie, how much time of animation you do? 10 minutes, maybe 30. Well this weekend i go to the cinema, i should hurry up if i want a ticket. 30 minutes, that's funny! Considering that over 30 animators worked on this film, if we each did 10 minutes, how long do you think the film would be? I did between 1 and 2 minutes of footage, which is about average for me. Oooh.. I love Toy Story! I will definitely watch TS3! I hope out cinema won't delay its opening here in our place. yeah i think that too, 30 minutes will be so much, but you take a year for 2 minutes? you did the animation of background too? I don´t know, but you spend so much time for that? pliss don´t think i want to challenge you or something else, i´m just have curiositi about. Pixar animators average about 72 frames (3 seconds) of finished animation per week. Sometimes we do all the characters, sometimes we share the shots. Either way, it takes a crew of 30-50 animators about a year to finish a film. The movie was amazing! I hate watching movies on the first day but, for you guys, I'm there. so you animate at 24 fps,it has to be hard keep the idea of the shot in one year! you improvise while you animate or you has to be attached to the plan of the storyboard? other thing today i went to the cinema and i saw the movie, oh God! in the end i can´t resist the tears i go away of the cinema crying, the movie is a master piece of art, congrats. ha! I forgot, who animate the secuence of the buzz dance? Cristian, we work on more than one scene over the course of a year. More like dozens of scenes. How closely we stick to the storyboards depends on what the director wants. Much of the Spanish Buzz stuff was animated by Carlos Baena. well, i have to study animation, thanks for answer my questions. You guys at Pixar must have made a deal with the devil! Every movie has been a home run. TS3 was incredible. The story to these movies is the "key" to Pixar's greatness. Please give us lowly people the guarantee that you boys n' girls at Pixar don't make a movie until a solid story has been agreed upon. You guys amaze me. And since Pixar is heading into seque-land I am a bit nervous, but if the story is solid it should be amazing. Also the short "Day and Night" is pure artistic genius!!! Congratulations and praise all around. it`s so embarassing, but I cryed on movie, was much importante to me. Congrats on Toy Story 3! It was fantastic! In general I prefer the animation on the toys more than humans in the movie. That little girl. Bonni, i guess. She was so cute! !